(CNN) -- Estudiantes de La Plata shocked Brazilian home side Cruzeiro on Wednesday to capture South American club football's greatest prize, the Copa Libertadores. Juan Sebastian Veron is showered in confetti in Belo Horizonte, Brazil, as he hoists the Copa trophy. The 2-1 aggregate win by Estudiantes marked the first Copa trophy claimed by the Argentinean team in 39 years, as they came from behind in a tense match that saw all goals scored in the second half. The teams played to a scoreless draw in last week's first-leg game in Argentina. Cruzeiro's Henrique scored the game's first goal in the 52nd minute, striking a long-range shot that deflected off Estudiantes defender Leandro Desabato, according to Goal.com. But five minutes later Gaston Fernandez tied the score from short range, giving the Argentinean team the edge on away-goals. Boselli headed in a corner from captain Juan Sebastian Veron in the 78th minute to seal the Copa trophy. 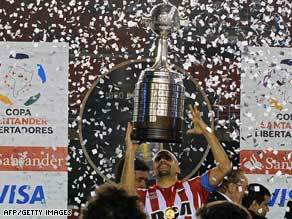 The Copa final this year marked the first time for Estudiantes to reach the championship round in 39 years. The small club won the Copa Libertadores for three consecutive years,1968-1970. This year also marked the 50th birthday of the Copa Libertadores, South American football's equivalent of Europe's Champions League. The Libertadores is the most prestigious tournament in South American club football, seeing the best 32 teams in the continent battle for supremacy. For years it was dominated by Argentina, with a team from the country making it to every final between 1963 to 1979, and Buenos Aires team Independiente winning six times in that period. Since the early 1990s, it's been the Brazilian clubs that have excelled. Brazil has provided 10 Libertadores finalists in the last 10 years, but since the tournament's inception, every country except Peru and Mexico has supplied a winner.